Etymology: from Greek rhodon, " the rose ", and dendron, " the tree ", because it is a tree carrying flowers showy and coloured, at the tip of stems, as rosebushes. Origin: Europe. There are species in America and in Asia. The one was brought from the Himalayas in 1820. 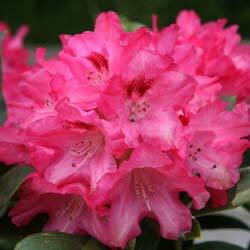 The ponticum Rhododendron is native to the Caucasus, from where it was introduced into 1703 by Tournefort. It is the most common in gardens where it produces a superb blossoming in May, composed of big clusters of colour, crossing lilac or purple, sometimes pink or white and mixing easily. Many cultivars were got producing flowers of all colours (yellow, orange, bright red, etc). 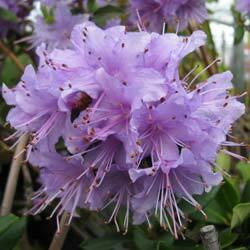 Hardiness: zone 7 (most rhododendron resists cold, until -17 °). Height: shrub of 2 m for most species. Some some attain 3-4 in Brittany, and others 30 m in Asia. Lifespan: 100 years under our climates. Persistent foliage (in most species); leaves persist 2 - 3 years. Leaves whorled, sharpened (10-15 cm), smooth margin, the upper dark green face, pubescent underneath, reddish-brown - rusty, marked by the eminent central vein. Final flowers, grouped by 10-20, with white, pink or red petals. They hatch in May and produce multicoloured hedges, according to species (mallows, white, red, yellow), which delight parks and gardens. The honey gathered by the honeybees on the rhododendron flowers can be toxic, because the flower contains a toxic molecule. The soldiers of Xénophon were victims, during retirement of Ten-thousand, to have used some rhododendron honey. Use: decorative garden shrub, very famous because of its nice spring blossoming and many varieties and cultivars which allow to vary colours. Danger: The molecule bearing toxicity is the andromedotoxine (diterpene tetracyclique). The rhododendron honey can be toxic. Rhododendrons do not appreciate the excess of sun, or wind: too much sun can cause yellowing of leaves with the appearance of small brown spots on the sun-exposed part of the young plant. The wind can burn the margin of leaves. And frost can harm leaves, which turn to dark grey. Early frosts in autumn or those late in spring, when the young plant is not in dormancy, can be harmful and cause cracking of the bark. Early frosts can also harm the new shoots then give distorted leaves. In Britain, there is an insect that lays eggs binding in the bud, leafhopper. The fungi that grow in cavities excavated by the larvae make the flowers wither. One should treat the problem, in areas where there is this insect. 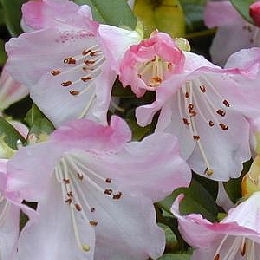 In late summer, fertilize ericaceous plants (azaleas, rhododendrons, camellias), but without watering them, to promote the appearance of fine flower buds for next year. It is possible to reproduce the rhododendrons and other ericaceous plants by layering.